I was feeling less than hopeful about shopping in L.A. It seemed as though there weren't any stores I could shop at without having to concern myself with where the clothes originated from. Why are restaurants now offering non-GMO, vegan, gluten free, etc options, and why aren't clothing stores offering something of the like? It wasn't until my friend, Jacqui, started to post all of these amazing photos working at this super cute boutique on her Instagram. She kept tagging brands that I recognized as being made in L.A. Knowing she lived in the area, I had to find out what this store was all about. Luckily for me the store she works at, Brigitte and Stone, is located really close to where I live! She and the amazing, Golriz Tavakoli invited me to come play dress up and hang out so I could learn more about the store. Golriz is an absolute gem! She had no doubts about strictly carrying ethically made clothing. 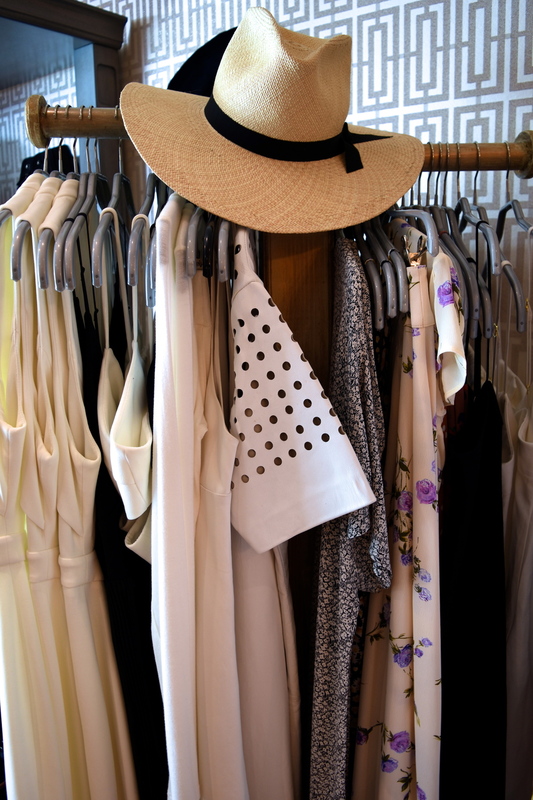 Her tasteful and elegant style radiates through the store's vast selection. When shopping here, you can guarantee that your purchase was made in an ethical way. For instance, this Mara Hoffman dress is only carried in her store because it's made in India (sweatshop free conditions). However, she is careful when purchasing from Mara Hoffman because only some of her clothing is made ethically (something I did not know). The girl knows her stuff! She also explained to me some of the (not so shocking) unethical practices used by certain designers to try and sway buyers, like herself, to carry brands in their stores. Without naming names, designers will make samples in L.A. of better quality, display them in shows, and lead people to believe their entire line is made in L.A. when really it's mass produced in China! Thank god for women like Golriz who are educated in this area and refuse to compromise her moral principles like many other of these not-so-chic-boutiques. Her store features brands like, Gladys Tamez, Stone Cold Fox, HolyStone, Flynn Skye, Pfeiffer, Sam & Lavi, Smythe, Rebecca Vallance, Rodebjer, Antonello, and many more! The store also carries the most incredible collection of vintage jewelry from designers like Tiffany, Buccellati, Cartier, and Van Cleef & Arpels. Her partner, Joya Yadegar, not only curates their entire collection of vintage jewelry, but also collaborates on the namesake, fine, trendy jewelry for the shop. If I haven't sold you on Brigitte & Stone, then you must check them out for yourselves! And since you're all scurrying around town picking up last minute Coachella pieces, then look no further! Here I'm seen wearing | Top Left - Stone Cold Fox Top & Rodebjer Jeans; Top Right - Rodebjer Dress & Gladys Tamez Hat; Bottom Left - Pfeiffer the Label Dress, Gladys Tamez Hat, & Antonello clutch; Bottom Right - Holystone Jacket. Brigitte & Stone is a dream for the sophisticated, elegant, and conscious consumer that you are. Thank you! You have successfully subscribed for One of a Kind Sustainability updates. CHECK YOU'RE SPAM FOLDER FOR CONFIRMATION! Subscribe to receive my latest blog updates and the latest brand updates on my Where to Shop page!